Now that you've met me, it's time to meet my beau. Beaujolais, that is. A wine that I love almost as much as people love their significant others. While I dream about the day I uncork my first Romanee-Conti Grand Cru, I head a bit further south of Burgundy to a little appellation called Beaujolais. Here, you can find awesome fruity and fun wine that costs a fraction of famed Bourgogne vin. Is it the same quality level? Nope. Is it even Pinot Noir (like red Burgundy wine)? Also no—it's from the Gamay grape. Is it age-able? I wouldn't recommend it. Will you get a decent French wine for a decent price? 110% yes, if you know what to look for. Let's go on a trip to France, shall we? Beaujolais follows a similar appellation system to most French wines, running from Beaujolais AOC (lowest) to Beaujolais Villages (intermediate) to Cru Beaujolais (highest). There's also Beaujolais Nouveau, a fresh, tootie-fruity wine released every November. Appellation (noun): A geographical name (as of a region, village, or vineyard) under which a winegrower is authorized to identify and market wine. Beaujolais AOC: This is the base of the Beaujolais appellation pyramid. You'll find these to be on the fruitier side with high acid and low tannin. They are not serious wines, but they are wonderful chilled on a hot summer day by the pool. Serve around 55 degrees Fahrenheit. Beaujolais Villages: I highly recommend seeking out these mid-level wines. 30 of the 39 villages can use their village name on their label, but most choose to use the "Villages" designation since their names aren't very recognizable. The wine at the Villages level is a higher quality thanks terroir punctuated by a hillier terrain and more granite-heavy soils. Cru Beaujolais: The elite class of Beaujolais wines with top terroir. There are 10 Crus to know: Saint-Amour AOC, Juliénas AOC, Chénas AOC, Moulin-à-Vent AOC, Fleurie AOC, Chiroubles AOC, Morgon AOC, Régnié AOC, Côte de Brouilly, Brouilly AOC. These will be labeled with their Cru and may not even mention Beaujolais on the label. (See the Brouilly example below.) To pick up one of these, keep a list handy. Each of the Crus has their own personality, running from light and floral to robust and spicy. My favorite? The newest Cru of Régnié. It includes a number of budget-friendly, organic wineries with strong flavors of raspberry. 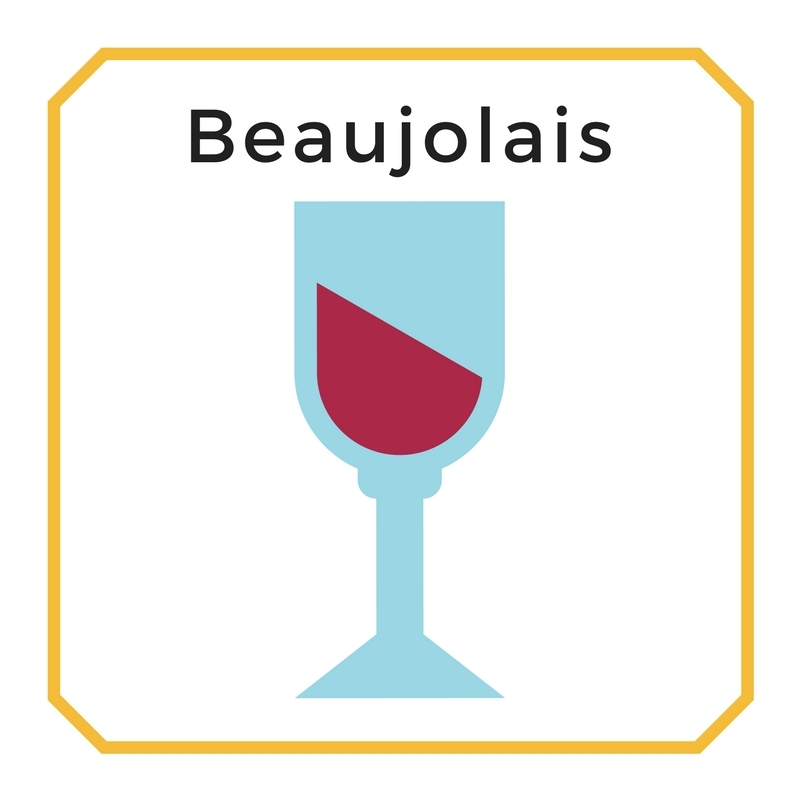 Beaujolais Nouveau: This is a category outside of the appellation ranks. Following tradition, Nouveau is released every year on the third Thursday of November. As its name indicates, it is literally brand new wine. 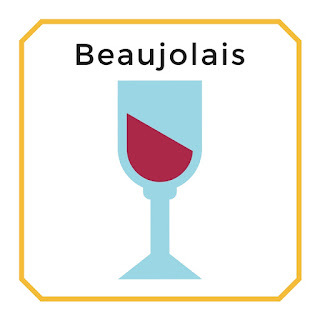 The traditional saying on "Beaujolais Nouveau Day" is "Le Beaujolais nouveau est arrivé!" Unfortunately I've never snagged a bottle of it but I fully plan to this year. I've read a lot of mixed reviews online with some saying it is overrated and others saying it is a jubilant experience. I'll keep you updated on my take! Unlike its more sophisticated cousin to the north, Beaujolais is made from the Gamay grape, not Pinot Noir. Gamay is a thin-skinned, red grape that ripens earlier and produces a fruitier wine. It tends to have lower tannins, higher acid, and an average ABV of 10-13%. You can serve it chilled, which makes it excellent for summertime sipping. In addition to flavors of raspberry, cherry, cranberry, and earth, you might also get hints of funky flavors like bubble gum, banana, and yeast thanks to the use of carbonic maceration. Before I explain what carbonic maceration is, let's take a step back and quickly review how red wine is typically produced. Basically, red grapes are crushed, the juice is left to ferment on its skins, and it is all pressed. The juice is then aged, filtered, and bottled. I recommend Wine Folly's article on red wine production if you'd like a more detailed refresher. Carbonic maceration is a technical variation on this process. Instead of crushing the grapes, they are piled into a tank where gravity coaxes some juice out. From there, natural yeasts begin fermenting the small amount of juice and the gaseous byproducts eventually permeate the whole grapes as well. Once that happens, fermentation begins within the intact, whole grapes and, voilà, we have carbonic maceration. Once the grapes burst, the juice is racked or pressed off and fermented further until it resumes the typical red wine making process. We are left with a light, fruity wine that's pairs perfectly with a wide variety of foods. Some of the many bottles of Beaujolais that I enjoyed on a trip to France. On the left, a Beaujolais Villages. On the right, a Cru Beaujolais. TIP: Save money while traveling by taking advantage of good value local varietals. If it's budget-friendly in the U.S., it's sure to be even more reasonable in its home country. The good news is that most Beaujolais is not incredibly expensive, even at the Cru level. That said, I highly recommend seeking out the Beaujolais Villages level. Here you'll find $10-$20 bottles of solid vin. I personally find this level to be slightly more refined than the base AOC but not as serious as the Crus. It maintains its Beaujolais ease. Well-known brands include Louis Jadot and Georges Duboeuf, both of whom are good, reputable wine merchants who produce a range of Beaujolais appellations. Once they've introduced you to Beaujolais, start exploring! I recently had a bottle of Les Violettes Beaujolais Villages that was only $8.99 from PA Fine Wine & Good Spirits. It was smooth and drinkable for a Saturday evening of sitcom re-runs and flatbreads with friends. From what I've seen, wine stores tend to group Beaujolais bottles in the red Burgundy section. Get over there and start reading some labels! Have you tried Beaujolais? What's your favorite Cru? Leave me a comment with your Gamay tips and tricks! Update: I had a chance to try a few bottles of the 2017 Beaujolais Nouveau! While they lacked any complexity, there was a smooth raspberry flavor that shined across the board. Tastes like a good harvest!